So you've got some heat issues that you think are just a little too critical for our standard exhaust wraps.. Worry no more! 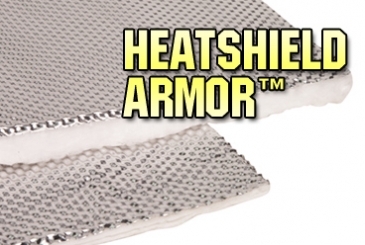 Heatshield Products has rolled out a new product called HP Armor. It's designed to be used on headers, turbo manifolds, down pipes exhaust pipes or whatever else you need to protect. Get ready to control heat in a big way. HP Armor can easily be used on flat surfaces or wrapped around components HP Armor is shown wrapped around exhaust components in our photos, but can be laid flat as well. It is flexible and easy to cut to fit where you need it to be. HP Armor can withstand 1800 F. continuous. It's easy to install because it's flexible and easy to cut. It has a protective outer armor shell that can be cleaned, too. Wrap this stuff around the exhaust system and Heatshield Products says it keeps the heat in, which creates a scavenging effect, allowing exhaust gases to flow out of the system faster. HP Armor is fastened using Thermal-Tie, a stainless steel hose clamp, or wire. Thicker, more durable, and better at eliminating radiant heat than standard exhaust wraps, this product will get the job done! The part number for this HP Armor is 175104. This piece measures 1 Foot wide and 4 Feet Long. It is 1/2" Thick. Use HP Armor to Insulate Exhaust Pipes radiating heat into the vehicle. Use HP Armor to Insulate Turbochargers emitting heat and causing damage to other components under the hood. Use HP Armor to Insulate Diesel Particulate Filters. Use HP Armor to Insulate the underside of vehicle hoods. Use HP Armor to Insulate modules and electronics from engine heat. The potential uses for HP Armor Insulation are endless! HP Armor is a superior solution for Automotive Heat Problems, but only a small fraction of the HP Armor we sell is for Automotive use! 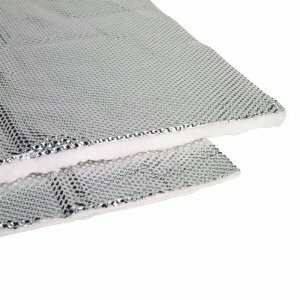 HP Armor is used in many non automotive applications because of its superior heat shielding and insulating capabilities. 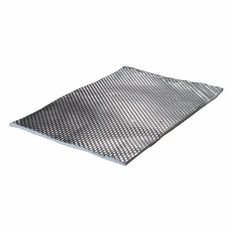 HP Armor is commonly used in several commercial, industrial, and marine applications. Some of our commercial and industrial customers that use HP Armor are: Oil Services Companies for use on drilling platforms and equipment, Fire Departments for use on Fire Trucks, and Heating companies using HP Armor on boilers and other heating systems. We also sell HP Armor to lots of marine companies for assistance with heat problems on marine diesel exhausts, bilge insulation, and more.